Talented Stylist Does Hairstyle For Seated Woman In Beauty Salon. Talented stylist does hairstyle for seated woman in beauty salon. She separates thin strands of light hair and combs carefully, while makeup artist applies powder to temple, with quick movement. Two experts work together, which significantly speeds up creation of image for beautiful client. stylist cuts a hair for a young woman in a beauty salon, makes a hairstyle for a girl. Beauty and haircare concept. 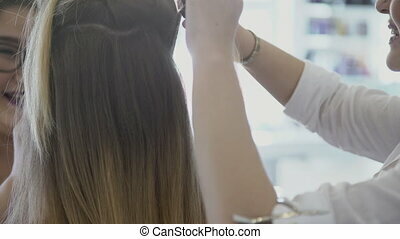 female hairdresser hand make hairstyle for long haired woman client in beauty salon. 4K UHD video clip. Artist puts shadows and hairdresser does hairstyle for woman sitting in beauty salon. Visagist uses purple shadows with tassel on eyelid of smiling lady, while stylist makes curls with hot curling iron. Two specialists are working harmoniously, embodies fashion image for young client. In beauty salon makes hairstyle and makeup for young woman. Lady sits while hairdresser does hairdo and artist puts colors on her face. Stylist takes strand of blond hair and captures with help of curling iron, making waves, and visagist in glasses creates fashionable image on delicate skin of client. Woman stylist applies hairspray on hairdo in beauty salon. 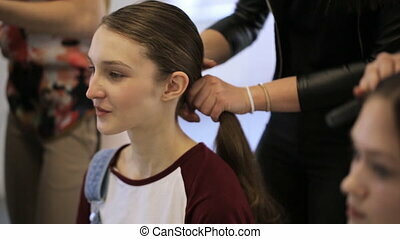 Female holds brown hair in hands and spray neatly with lacquer for fix hair on fashionable hairstyle, then combs. 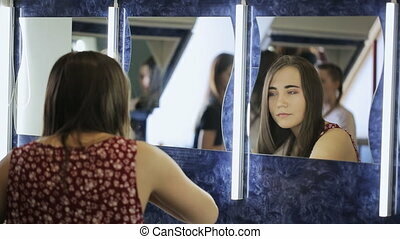 Experienced expert works diligently, standing near attractive client who sits next to large mirror. Female hairdresser does hairstyle of sitting lady in beauty salon. Specialist holds thin strand of dark hair and combs, then takes heated curling iron and makes curls neatly. Attractive woman dressed in white shirt, engaged in favorite business, standing near young client. Woman hairdresser touches hairstyle of young lady sitting in beauty salon. She concerns neatly to wavy blond hair of client, adjusting hairdo with hands. Creative specialist with red manicure on nails, makes final touches, correcting image she created for businesswoman. Young woman sits in beauty salon on hairstyle and makeup session. Artist in glasses paints lips of client gently with lipstick and brush while hairdresser makes round curls. Creative experts create skilfully fashionable image, matched individually for beautiful lady. Female hairdresser does hairstyle of lady sitting in beauty salon. She holds thin strand of blond hair, twists it and lifts it to top of head, inserting into hairdo. Experienced specialist dressed in white shirt, with red manicure and metal bracelet, works carefully with hair of young client. Hairdresser does hairstyle of lady while artist puts make-up, in beauty salon. 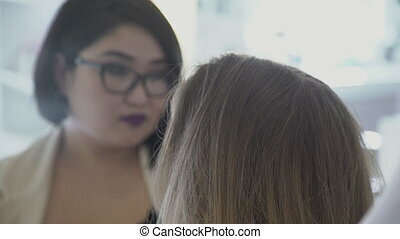 Female stylist does hairdo, holding black device in hands and talking to partner who applies lilac shadows on eyes of seated client. Young specialists successfully work in tandem, speaking with each other in friendly manner. Young woman sits in beauty salon, waiting to complete process of hairstyle. Beautiful brunette with bright makeup on face, looks forward sometimes closing eyes while hairdresser is making fashionable coiffure. Female spends time patiently in modern saloon. Woman hairdresser straightens hair using curling iron in beauty salon. Young female holds strand of blond hair in hands and grabs it with heated device. Talented expert dressed in white shirt takes care of young clients hair, working diligently. 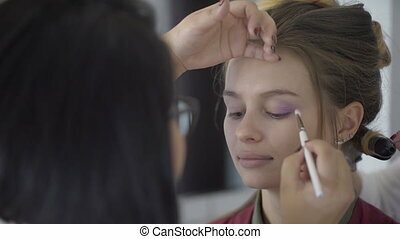 Make-up artist in beauty salon applies shadows to eyelids of woman. For female client make-up artist applies neatly cosmetic products to skin of face. 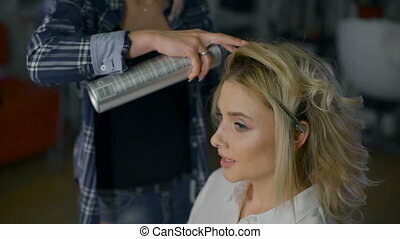 Hairdresser is spraying hairspay on hairstyle of beautiful lady in beauty salon. Woman touches hair strands with hands and uses laquer to fixate fashion hairdo. Talanted expert dressed in white shirt completes image of client on whose face there is fashionable makeup, sitting with closed eyes. Woman hairdresser straightens ladys hair with curling iron in beauty salon. 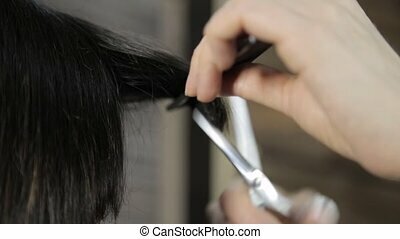 Specialist clamps strands of dark hair with black device and pulls them neatly. Positive female with bright manicure works in light room while artist puts make-up to client face, standing in front and smiling. 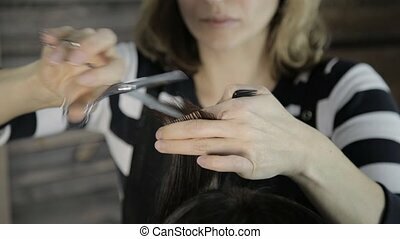 Experienced hairdresser combs hair of lady standing in beauty salon. 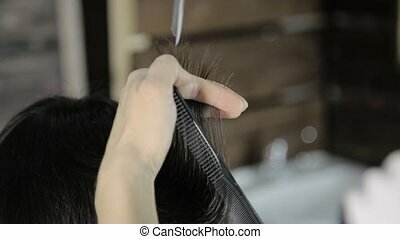 Attractive woman takes thin strand of blond hair and combs it neatly with plastic comb. Creative stylist dressed in white classic shirt works diligently, preparing hair of young client for fashionable hairstyle. Experienced hairdresser touches hairstyle of sitting lady in salon. Woman concerns with hands, finishing hairdo for beautiful client, then helps her to take off protective covering. Young female as high level professional, skillfully embodies bold ideas and feels inner state of customer. 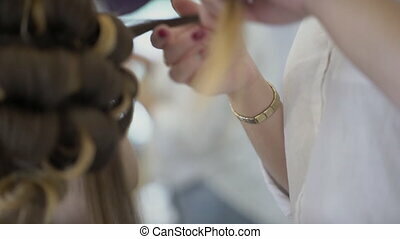 Bride prepares for wedding, making hairdo in beauty salon. Young beautiful woman, sits in armchair, dressed in styling cape, with long blond hair, with professional gentle makeup and anticipates when the stylist completes her image, finishing hairstyle. Hairstylist makeup artist, finishing maquillage, began to hair, winding hair on curling iron and collecting them in neat bun on occipital. Hairdresser fixes strand of hair with hairspray and hairpin. Unfocused background. Hairdresser combs hair of client while artist does makeup in beauty salon. 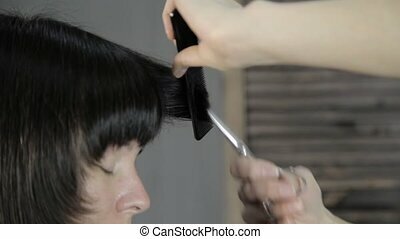 Stylist combs hair carefully using brush and female visagist applies colors, standing in front of ladys face. Two experts work smoothly and quickly, doing each their own business. 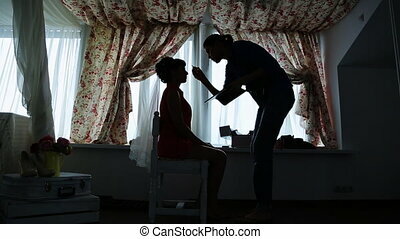 Professional visagiste does make-up for fiancee in dark room. Light of twilight sun penetrates through windows in appartment and highligthes silhouettes of two ladies. Casements are decorated with beautiful curtains beautified with colourful floral print. They create cozy and comfortable atmosphere inside. Stylist carefully operates with brush to spread cosmetics evenly on face of bride. Female sits calmly and patiently waits until end of procedure for going out. Pretty young girls prepare for photo session in beauty studio. Their friends help them to have well-groomed appearance for shoot to look like super star. Females operate with their hairs creating beautiful hairstyle which suits their helpmates. Brunette, who is busy with blonde girl, is dressed in stunning blouse with floral print. This clothes highlights freshness of her face. She tries to do her best to create intresting image for her girlfriend. Chinese woman does make-up to model sitting in dressing room. She carefully draws shape of eyebrows to create amazing look for photo shoot. Young mannequin is concentrated and calm, she patiently waits until end of procedure. 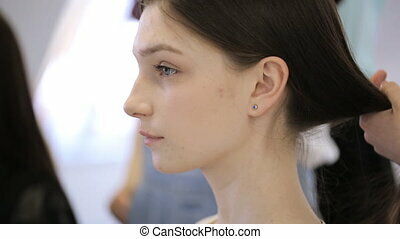 She wears tunnels in her delicate ears and her fair hair plays with tints of blue colour. Female has informal look like alternative kind of model. Stylist has blonde hair, that gives additional charm to her image, and her fingernails are painted in red. In model school woman is waiting her hair done in hairstyle. Young and beautiful female is sitting in chair and standing behind girl is brushing hair preparing it for further work and. She is looking ahead concentrated on herself, thinking over something important wearing brown long straight hair and violet blouse. Makeup is simple about black mascara. There are more people working with hairstyles trying to achieve the same result. Portrait view of woman waiting for hair done in model schools. Young female standing behind is making hairstyle comfortable for moving. Putting her hair together in pony-tail and fixing it with scrunchy she is spinning it around getting her ready for runway, working or walking. She is wearing casual old school style t-shirt of white and red colors and glasses. Sitting girl is talking about fashionable designers or show, magazines and photo shoots. Close up view of woman making hairstyle. Standing in model school young and beautiful female is working with hair putting it together in pony-tail or bundle for comfortable moving and walking on runway. She is asking something or talking with friend looking in mirror in front. She is wearing long loose dark hair and flower patterned sleeveless blouse. Female standing nearby is doing same thing wearing black casual clothes and same colored hair. Young female is waiting for hair done in model schools. Putting hair together in pony-tail and fixing it with scrunchy woman standing behind is making hairstyle comfortable for moving getting her ready for runway, working or walking. Smiling she is looking ahead concentrated on herself, thinking over something important. There are more people working with hairstyles trying to achieve the same result trying to be fashionable, beautiful and attractive. In model schools young female is waiting for hair done. Woman standing behind is making hairstyle comfortable for moving. Putting her hair together in pony-tail and fixing it with scrunchy she is getting her ready for runway, working or walking. Sitting girl is talking telling something interesting about fashionable designers or show, magazines and photo shoots. She is wearing casual old school style t-shirt of white and red colors. Young females in model school are preparing for lesson. Women standing behind girls are brushing their hair making hairstyle comfortable for moving. Getting ready for runway girls are making parting in hair getting ready to further braiding, working or walking. All are wearing casual clothes of bright colors such as patterned blouses and jumpers, workers long loose straight hair. Sitting people are concentrated and calm in waiting looking in mirror. In model school the young and beautiful woman is sitting waiting her hair done in hairstyle. Female standing behind is brushing hair preparing it for further work. She is looking ahead concentrated on herself, thinking over something important wearing black long straight hair, jewelry like small blue earring and beige blouse. Her eyes are dark blue. Makeup is simple about black mascara. On the background more people are working with hairstyles trying to achieve the same result. 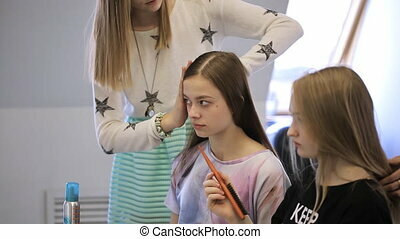 Young female is straightening hair in model school. 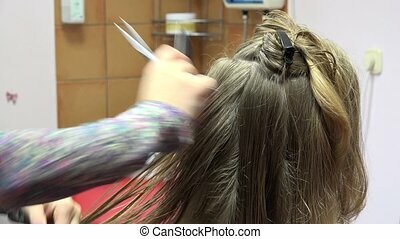 Woman is making hairstyle with hot iron preparing to fashion show or photo shoot sitting in chair in front of mirror looking and monitoring process getting ready for runway. Girl is wearing long loose dark hair, simple makeup and flower patterned dress. There are lamps lightening mirrors hanging on dark blue wall patterned and hair brush lying on surface of pier glass of table standing under.